I have voiced my displeasure on Indian TV shows more than once here. But, today, I take it all back. Like all things in life, these slow-moving, seemingly-full-of-cunning TV serials also serve a purpose. They teach us a lot about relationships. They teach us a lot about people. And they teach us about life. I have been watching only two shows these days, on a regular basis (refer to previous post "Show Time"), and I have already learnt such a lot. 1. Always keep your distance from housewives having no constructive pastime. Since they have little to do in their own life, they WILL interfere in yours. And the more insecure they are of themselves, the more they'll try to disrupt your life. 3. Resistance/refusal to change, or to see a different viewpoint, is what leads to the slow pace of story in TV serials... as well as in life. The more obstinately we stick to our "comfort zone", the more boring and dissatisfying our life becomes. If we want our life and relationships to change, then WE must change, from within. Blaming destiny or any other external "variables" is totally useless. 6. People may not always be what they seem to be. 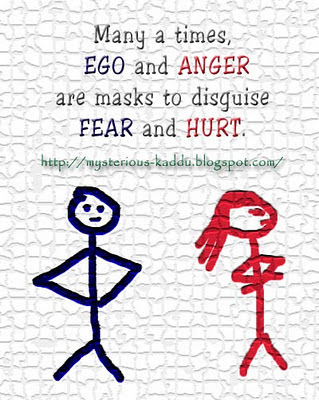 Disguising our real self is an art we humans learn at a very early age, as a part of our "101 survival kit". So the reality of most people lies in not what they reveal to you, but in what they cannot reveal to you. 7. When it comes to relationships, most men are as lost as a ship without a compass, on the sea. So, if your story was to be made into a TV serial, what would it be like? Boring? Interesting? Gloomy? Inspiring? Would you desire to change anything in that story? Would you be willing to change yourself for that? Your last point? on men.. I expected you to be more understanding towards men!! But otherwise I like your explanations! Oh that point was actually a mark of my understanding! It meant to signify that I don't consider men as evil... rather they're just dumb when it comes to handling relationships... just like some people are dumb at working on computers, or some (like me) are dumb at using makeup... etc. I am brilliant at handling relationships. I know instantly when I am being dumped. Excuse me. I allow myself to get dumped only because I can't bear to hurt a delicate damsel by dumping her. I should be knighted not mocked.